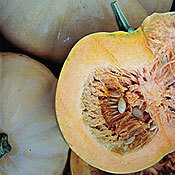 description for "Winter Squash and Pumpkins: Cucurbita moschata, 'Texas Indian Moshata'"
Cucurbita moschata 'Texas Indian Moshata' is an unusual, rich-tasting variety from Curtis Showell, who maintains many lines of heritage squash, pumpkin, and melons. Light-tan fruits of 'Texas Indian Moshata' are shaped like flattened pumpkins with smooth skin and shallow ribs. Extremely long keeper. 8-12 pounds. Planting depth: 1 inch. Days to germination: 4-10 days. 100-110 days to maturity. reviews for "Winter Squash and Pumpkins: Cucurbita moschata, 'Texas Indian Moshata'"